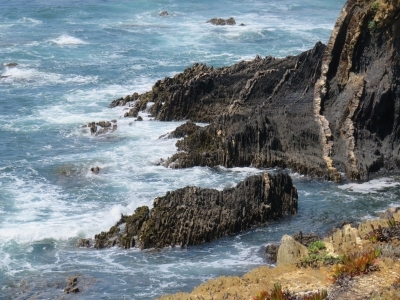 Southwest Coast is part of the Tentative list of Portugal in order to qualify for inclusion in the World Heritage List. Utilizing a car rental (Fiat 500) my wife and I drove from Coimbra to Lagos. However, once we passed Lisbon and approached the Northern portion of the Southwest Alentejo and Costa Vicentina Park, we got off the toll road and took the highway that runs along the coast (though not ON the coast like the PCH in California). Our first stop was in Almograve, which did not disappoint. We've explored the California coast for a decade and fallen in love with its rugged beauty and I was so pleased to see this equally rugged and beautiful coast in Portugal! Its hard not to compare these coasts, but it should be noted they are still vastly different in regards to inland habitat, biodiversity, and geology. Where they do compare however is in the visitor experience, as you park your car and are rewarded with expansive coastal views, secluded coves, and interesting rock formations. My two stops along the Western coast (Almograve and Odeceixe) worked out very well and the detour off the toll road was more than justified. Before I move on to the sites in the southern portion of the park near Lagos, I should mention a special feature about Odeceixe which is situated on the Rio de Seixe (River Seixe), right on the border between the Algarve and the Alentejo. When rivers and oceans meet, they often form quite spectacular landscapes, Odeceixe is certainly no exception to this. Far more busy than Amograve, but very special nevertheless. Having 3 nights in Lagos gave us plenty of time to explore the Cape of St. Vincent and Cape Sagres. The wind can be very intense here and the amount of visitors is also quite large in comparison to our visit to coastal sites in the Alentejo. These two factors did not ruin the experience, but it made exploring both capes slightly more challenging! I found the fortress in Sagres somewhat disappointing and I would not add much beyond what Nan described. On the way to the Cape of St. Vincent, I would add that the Fortaleza do Beliche is worth stopping, indeed this site provided the best view of the cape and this fortress feels more authentic in its ruined state. As most world heritage travelers researching this area will know (or discover), the sites near Lagos are also part of the "Sites of Globalization" tentative nomination. There is even a small museum about some of this history near the lighthouse at Cape St. Vincent. So while the sites near Lagos may be more tempting for the world heritage enthusiast, I would suggest considering renting a car and exploring additional sites along the Alentejo. California is mentioned in the "Comparison with other similar properties" section and while in some ways comparable, the Southwest Alentejo and Costa Vicentina is still quite different. I would love to explore more of this park and I hope that its protections increase. In addition, more information panels should be installed, perhaps 1-2 visitor centers could be built, and there may be some work needed regarding private ownership within the park. Overall, this exploration of the Southwestern Coast was one of the highlights of my visit to Portugal. The proposed area runs along the coast line from Sagres in the South up to Sines in the North. It's easiest to access at Sagres which can be reached by local bus from Lagos. In Sagres the main site is the fort. While the buildings are of less interest, you get great views of the cliffs and a good feeling of the immense force of the Atlantic ocean. There are holes in the rock and you can hear the sea roaring beneath you. It's also a bit bewildering to see all the Portuguese fishermen standing at the edge of the cliffs, 50m above the sea, with their fishing rods and little to no safety measures taken. Apart from the fort the beach in Sagres is popular with surfers and that's it. 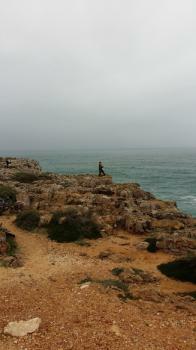 From Sagres I hiked to Cape St Vincent and then along the coast line to Vila do Bispo. The path from Cape St Vincent to Vila do Bispo is rather strenuous due to rocks. Also, the sign posting isn't very helpful and I repeatedly lost the official track. But the views do make up for it. Difficult. I liked the site and enjoyed my visit, so I wouldn't mind. But I am not sure why these cliffs should be more special than those in Dover, Etretat or Rügen. There are buses running from Lagos to Sagres. In summer they will continue to Cape St Vincent. From Lagos you can travel all along the Algarve. Long distance busses will even take you to Seville and Lisbon. If you are looking for the Sagres brewery, you will go home empty handed. The beer named Sagres is not actually from Sagres. Lagos is worth a visit, even though mass tourism has left its ugly foot print on the city. When I went there shops at Capo St Vicente were closed. I should have brought provisions.